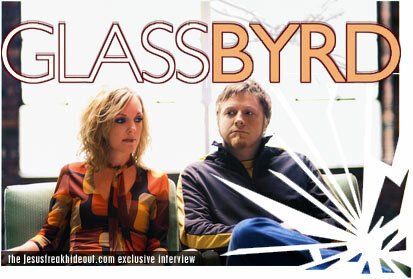 GlassByrd combines the unique talents of Common Children frontman Marc Byrd and solo artist Christine Glass to create one solid modern worship team. The duo sat down for us recently to answer a few questions about their debut Open Wide This Window, marriage, and the future. Jesus freak Hideout: GlassByrd introduces the collaborative talents of Marc Byrd and his wife Christine Glass. However, this project isn't the first time you guys have worked together. A couple years ago, you recorded a few songs under the name of "Adore". What happened with the name change and the shift from a planned Adore project on Essential Records to a GlassByrd release on Warner Christian? Christine Glass Byrd: We found out that the name Adore was already taken by a number of other bands, so we were forced to come up with something original. As far as I know, there were never any plans to release a full album on Essential. Someone at Word heard a copy of a few songs that we had recorded together and approached us about signing there. JFH: How would you say GlassByrd differs from your two previous individual projects (Christine's solo career and Marc's band Common Children)? Christine: GlassByrd is more overtly Christian and intended to speak to a broader Christian audience. We were interested in exploring what we all have in common, rather then focusing on extremely personal issues. Also, it is a thank you to the audience who embraced God of Wonders. Marc Byrd: It's more mellow. JFH: Do you have plans for any more Common Children or Christine Glass projects? Marc: The future is wide open. Who knows? JFH: Marc, your work on City On a Hill was something completely different than anything you had done at the time. Has the success of "God of Wonders" felt surreal in a way to you? Marc: "God of Wonders" surpassed my wildest dreams. At the time when I started writing it, and then once Steve and I had finished it, we both thought that it was probably a good song that a good chance of being doomed to obscurity. All I can say is that I'm thankful and grateful. And its wonderful to see a song that was written from a broken and honest place being received by so many. JFH: Open Wide This Window is a delicate project with a lot of vulnerable themes of brokenness and mercy being conveyed through worship. Have any specific experiences inspired these themes? Marc: Sure. Our family struggles, our meeting and marrying, being involved with City on a Hill - all of these things factor into the record. There is the experience of mercy and living a life of faith within the context of a broken world. JFH: Do you see GlassByrd as a long-term project or kind of a side project from your other endeavors? Christine: I see it as just one more step in a (hopefully) long career. We would love to make another GlassByrd record if this one sells enough for our label to keep us. JFH: What is your favorite song on Open Wide This Window? Christine: In so many ways. Fundamentally, my relationship with Marc has given me hope. It is easier to believe in a loving Father when you have someone who loves you so well right here on earth. Marc: Marriage has brought joy to my life and humility. It has given me a center, a point of reference, a home. JFH: My fiance and I are finally tying the knot on June 21st, what kind of advice would you offer to newly weds? JFH: What scripture verse has had the most impact on your day-to-day in Christ? Christine: II Timothy 1:7 "For God hath not given us the spirit of fear; but of power, and of love, and of a sound mind." This is one that I struggle with on a daily basis. Marc: Colossians 2:2b-3 "That they may have the full riches of complete understanding, in order that they may know the mystery of God, namely, Christ, in whom are hidden all the treasures of wisdom and knowledge." Marc: Sleeping in the Joshua Tree National Park (with Common Children) under the stars. We had no money and only beef jerkey to eat that night, but it didn't even matter. Marc: Christian music is a gift and I believe its main purpose is to encourage others in their own walk of faith. However, what we do is nothing compared to those who, on a daily basis, comfort and aid those in need. So we would encourage everyone, including ourselves, to be the hands and feet of Christ in this world. Get involved in your community. Put feet to your faith. Paraphrasing Brennan Manning, I would rather see the church err on the side of too much compassion than too little.